Another easy peasy, 5 minute card today. This is for the TLC336 at Splitcoast where we are to stamp our sentiments over the image and the CAS129 to create a belated birthday card. This is a spritzed watercolor technique card. Using three different colors of green markers, I started at the top of the image and added color down the image. My lightest color was used at the top and the darkest at the bottom. 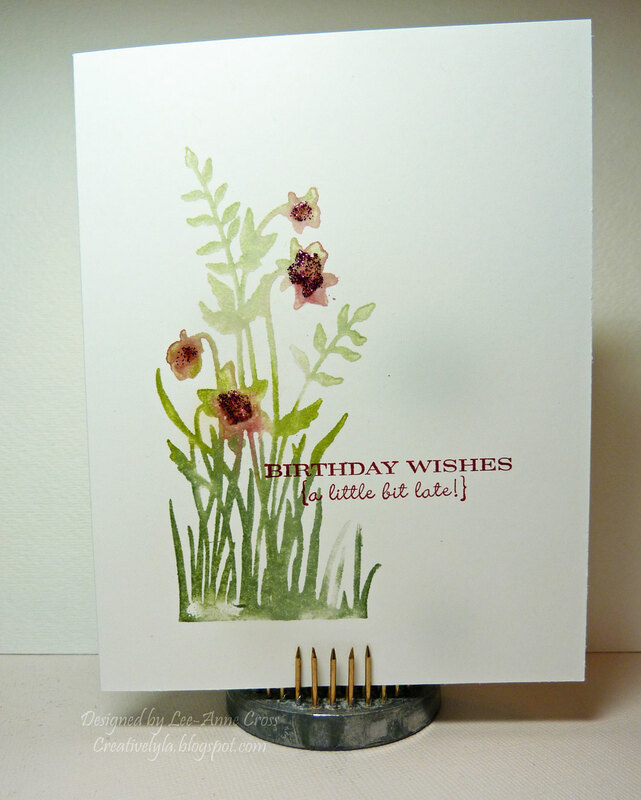 Next, using my Cherry Cobbler marker, I added a little bit of color to the flowers in the image. Then I spritzed the stamp with a couple of sprays of water and stamped it onto my card stock. Next, I stamped the sentiment, partially across the image and added a little bit of Stickles for some interest. And there you have it…a card in 5 minutes! Very pretty card—love that image and sentiment. Reminds me that I need one of these too! Ooops!